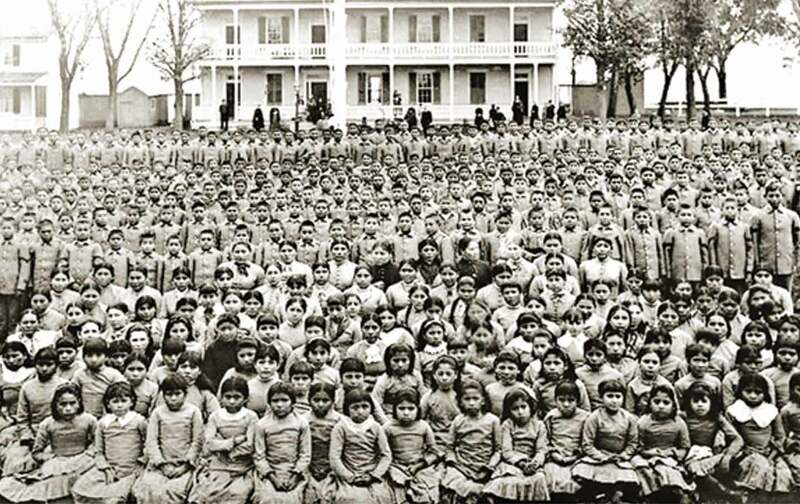 Stolen youth: Students at the Carlisle Indian Industrial School in Pennsylvania, circa 1900. Reported in partnership with InvestigateWest, this investigation won 2nd place for The Native American Journalists Association's annual awards in the category of best feature story. Gary Williams, a member of Arizona’s Gila River Indian Community, was driving across the Arizona desert, listening to the radio, when he first heard about one of the Goldwater Institute’s ICWA lawsuits. Williams immediately pulled over to the slim edge of the highway to listen carefully. His heart raced. Williams is a living example of what could happen to American Indian children without what he calls “the safety net” of ICWA. His mother, a member of the Gila River Indian Community, died before he turned 1, and before ICWA was law. Williams and his three older siblings were placed in Arizona’s foster-care system. Over the next 15 years, he was separated from his siblings and sexually and physically abused. In all, he lived in seven different foster homes and one large institution. Williams’s story of being separated from his family and tribe is common in Indian country. From the mid-1800s into the 1970s, tens of thousands of Native American children were taken from their homes, sometimes forcibly, and sent to government-run boarding schools, often hundreds of miles away. Intended to “kill the Indian…save the man,” the schools prohibited students from speaking Native languages or practicing tribal ceremonies. In 1958, the Bureau of Indian Affairs funded the Indian Adoption Project to find homes for the “forgotten child” who was “left unloved and uncared for on the reservation, without a home or parents he can call his own,” in the words of the project’s director. In fact, many of these children were being cared for by grandparents or aunts, traditional kinship roles in many Native communities. In response, Congress passed ICWA in 1978. The law was intended to “promote the stability and security of Indian tribes and families” by limiting the state’s ability to remove Native children without good cause. It requires states to make “active efforts” to keep children with their parents. If this fails, a state must first attempt to place the child with a member of her extended family; second, with another tribal member; and finally, with an unrelated Native American family. In ICWA cases, tribes or parents can request to transfer the case out of the state court system and into tribal court. Eighteen national child-advocacy organizations, including the Children’s Defense Fund and the Casey Family Foundation, have called ICWA the “gold standard” in the field of child welfare. Studies have found that when Native youth are connected to their culture and feel pride about it, they’re more likely to have better grades and to attend college. Conversely, growing up separated from one’s cultural group can have deleterious effects, including an increased risk of depression, substance abuse, and suicide. But Alito’s emphasis on Baby Girl’s distant connection to her tribe is mirrored by Goldwater’s allegation that it is unfair to subject Indian children to a different set of rules, especially if their tribal connection is remote. Goldwater alleges that the law hurts kids by delaying their placement in stable homes, and by sending them back to live with potentially abusive parents. Simmering close to the surface of Goldwater’s argument is the tacit accusation that children growing up on reservations are likely to be disadvantaged. “Native American death rates are rising and they have the lowest life expectancy rates, thanks in no small part to the way government policies have made reservations into economic wastelands,” Sandefur wrote on his blog last September. Goldwater has yet to be validated in court. In January, the Supreme Court declined to hear R.P. v. LA County, a case in which Goldwater had filed a supporting brief alleging that ICWA had harmed a child by not allowing her to stay with a California foster family rather than be sent to Utah to live with her sister and other relatives. And late in March, an Arizona federal judge dismissed A.D. v. Washburn, saying that Goldwater had failed to show how the law caused real harm to its plaintiffs. Even so, these cases aren’t going away. Goldwater characterizes the Arizona judge’s ruling as nothing more than procedural and plans to take the case to the Ninth US Circuit Court of Appeals. The organization is powerfully connected: Its former vice president for litigation now serves on the Arizona Supreme Court, and Charles Cooper, whose firm partnered with Goldwater in the class-action case, is a close friend of US Attorney General Jeff Sessions. A ruling in Goldwater’s favor, according to Fort and other legal experts, could undermine the authority of tribal courts, shutter tribal casinos, and open up reservations to privatization, something that could benefit oil and gas developers like the Koch brothers. While Goldwater denies that its ultimate goal is to undercut tribal sovereignty, some of the institute’s allies embrace the charge. “Maybe we should get serious about the 14th Amendment and equality and do away with federal Indian policy and say, ‘You’re an American like everybody else is an American,’” said Darrel Smith, who serves on the board of directors of the Citizens for Equal Rights Foundation, a national organization that has long fought to diminish the power of tribes. Smith’s group has filed an amicus brief in A.D. v. Washburn.